Outstanding images at an even better price. 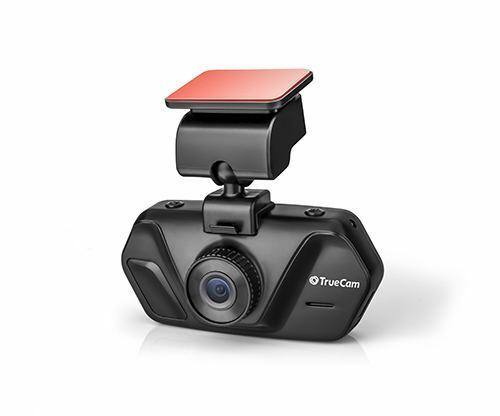 The TrueCam A4 in-car camera is ideal for anyone looking for high quality without compromise. The top-quality lens captures an impressively clear, bright, high-quality recording and this combined with its ease of use makes this model one of the best in its class. Most functions are accessible at the touch of a button and the English menu controls on the LCD display are simple and intuitive. Loop recording means that you do not have to worry about free space on the memory card. The TrueCam A4 camera controls are simple. The basic functions can be controlled at the touch of a button. Thanks to a special mounting system, installing the camera every day is quick and painless. The camera can be attached firmly with an adhesive mount or by using a portable suction cup. Backlit keys and the clear 2.7″ LCD with English menu. Both can be easily turned off when needed. 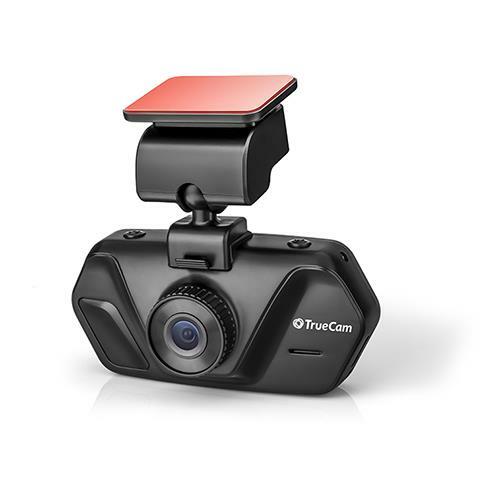 The TrueCam A4 dashcam – high quality, affordable price and convenient to use. 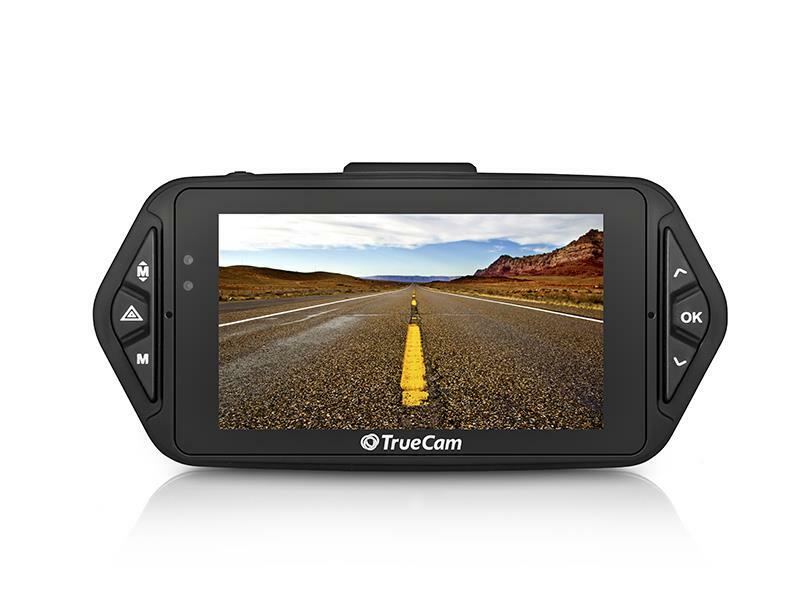 The TrueCam A4 dashboard camera shoots in FULL HD 1080p. Footage from this on-board camera is so clear than you can easily recognise details such as a person’s face and appearance or a vehicle registration plate. No matter whether you are shooting at night, during the day or whether there are good or poor lighting conditions, the TrueCam A4 will always take a sharp high-quality image. For products that you use on a daily basis, it is important that it is as simple and painless to use as possible. With the TrueCam A4 in-car camera, its special holder ensures that there is no need to adjust its position or attach power cables every day. The car camera simply snaps in place, and you are ready to go. 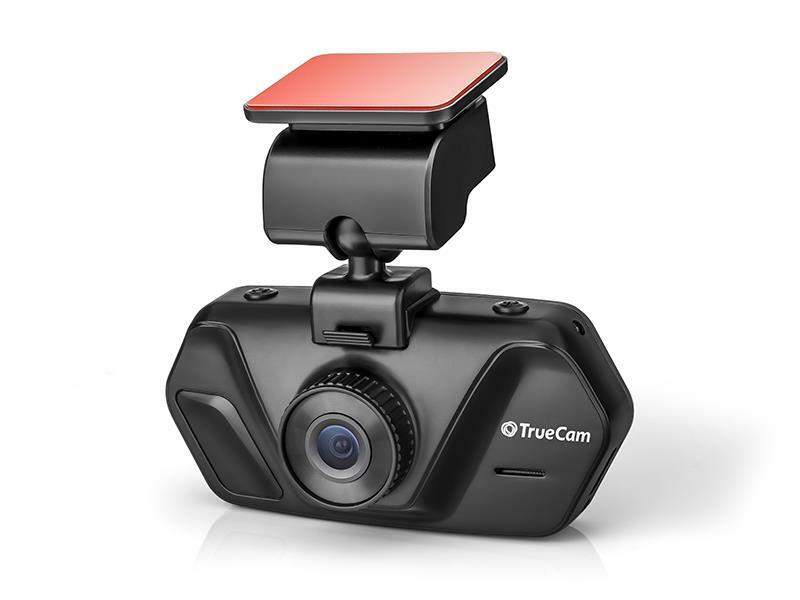 With the TrueCam A4 dashcam there never needs to be free space on the memory card. When the memory card becomes full, this on-board camera will overwrite the oldest recordings. Previously shot video can be easily locked by pressing a dedicated button which will protect it from deletion and for future reference. G-sensor (accelerometer, gravity sensor) detects movement in three dimensional space and in the event of an accident, it captures the collision and automatically locks the recording against accidental overwriting during loop recording. The sensitivity of the sensor can be simply adjusted in the menu. If you would like to save some footage for later reference, you can do this at any time using the dedicated button which locks it against overwriting. The button can be used at any time whilst recording as well as for previously recorded video. Videos or photos can be unlocked and deleted manually at any time. 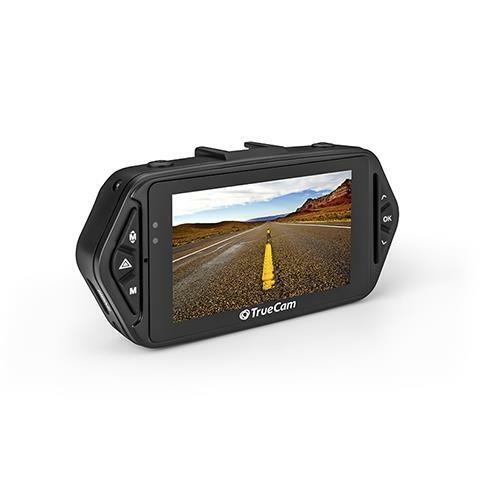 Thanks to the 2.7″ LCD display you can easily check the current video being shot, play previously recorded footage or adjust the camera settings. Using the camera is trouble-free as the clear and simple English menu means that it can be easily operated by anyone. The TrueCam camera begins recording as soon as movement is detected. This feature is particularly useful if someone backs into your vehicle or causes damage to it. In these cases you will have clear evidence in the form of the registration number or the offender’s appearance. The TrueCam A4 car camera is equipped with a high-quality lens with excellent luminosity. As a result the in-car camera can capture high-quality images even at night. Filming or taking photos in low light conditions is no problem for the TrueCam. Thanks to WDR the in-car camera better captures images at a high contrast ratio. Therefore the easily handles it when part of the image is more or less illuminated. A typical example would be of the contrast between light and shadow or between a dark road and the lights of oncoming traffic. 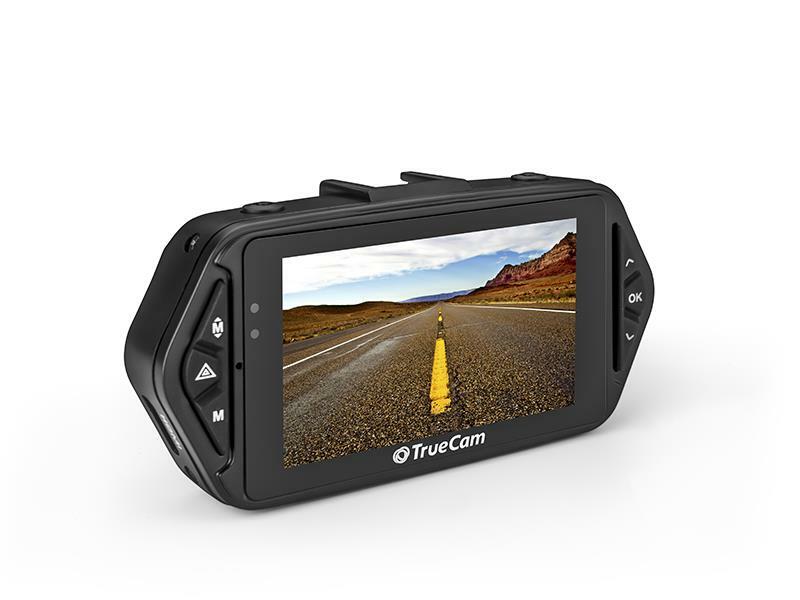 Along with the TrueCam A4 camera it is possible to purchase a detector which alerts the driver to fixed speed cameras, average speed cameras, red light cameras and other places where it is good to exercise caution. Our database contains more than 33,000 locations in 36 Europeans countries and Russia. Using voice guidance the driver is warned of upcoming dangers or excessive speed. The database is extremely accurate and includes free updates. Practical, simple and a pleasure to use every day. If the display of the in-car camera distracts or dazzles you, you can quickly shut it down at the push of a button without having to search through the menu settings. The dash cam can also be set up to automatically to put the display into sleep mode after a selected time interval. If you do not require the sound to be recorded, it can be disabled by pressing the dedicated button. This function is convenient, for example, when on a call or whenever you do not wish the sound to be recorded. 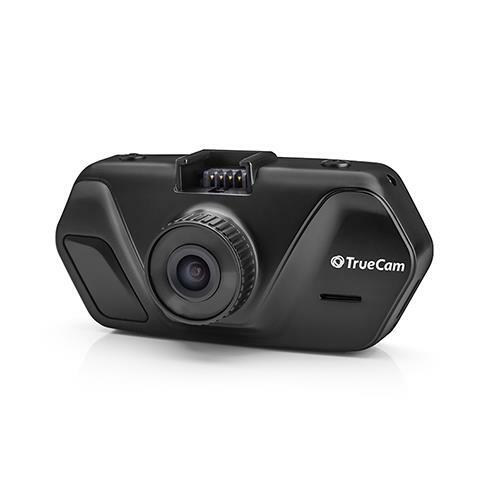 The TrueCam A4 car camera is one of the few cameras that allows you to take photos whilst filming without interrupting recording or adjusting any complicated settings. The camera also allows you to take photos from previously recorded video at the push of a button. The camera allows manual exposure settings or EV. In the menu you can choose the exposure level as required. After manually setting the brightness level of the LCD display in the menu, you will see which level suits you best. The car camera, of course, allows you the option to have automatic exposure. The on-board car camera allows the driver to set the name that appears on the video. This function is especially convenient when one vehicle is used by multiple drivers. Thanks to this function, there is no problem identifying a particular driver. The dashboard camera can be positioned wherever you desire. The camera can also be placed upside down. Simply select the 180° mode to turn the video to the correct orientation. The menu also rotates so that the camera can be easily operated. For trouble-free operation in the dark, the TrueCam A4 car camera has backlit function keys. The backlight has been adjusted carefully so as not to dazzle you whilst being fully functional. However, if necessary, it can be easily turned off. 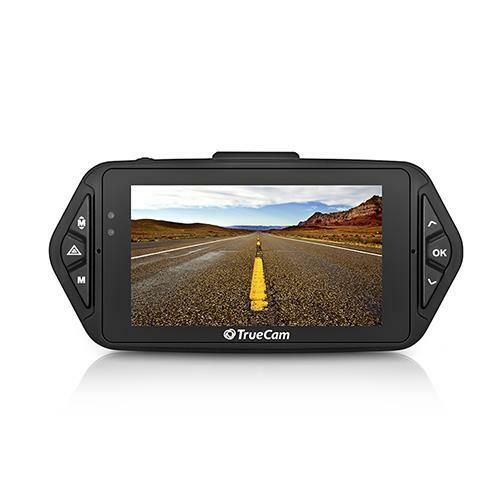 For the Truecam A4 dash cam you can also buy a GPS module with speed camera detection. The car camera will alert you when you need to drive carefully in 36 countries in Europe and around. 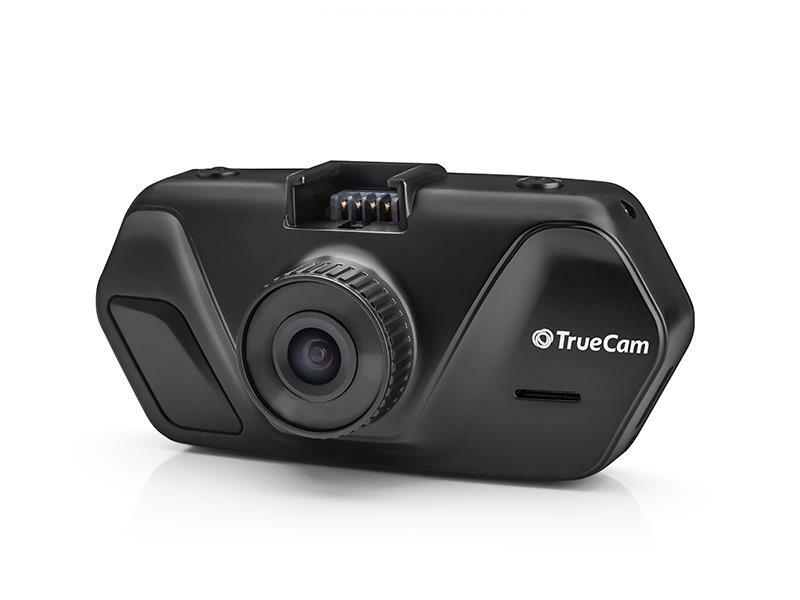 The TrueCam A4 car camera recorder – excellent lens, numerous functions and easy to use.